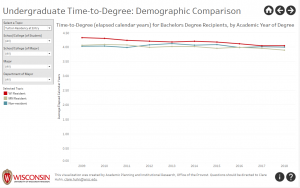 This data visualization shows trends in undergraduate time-to-degree, along with peer comparisons between UW-Madison programs and with similar programs at other major public research universities. Average number of terms-to-degree and credits-to-degree, 2016-17 – A by major table of the average number of terms and credits to degree for 2016-17 bachelor’s degree recipients. Progress-to-Degree Measures – A one-page summary of undergraduate progress-to-degree measures including the most recent retention, graduation and time-to-degree metrics. Progress-to-Degree Presentation – A presentation containing information on undergraduate time-to-degree, graduation rates, and peer comparison data for majors and the overall institution. Characteristics of Three-Year Graduates. This analysis shows the characteristics of the undergraduates who graduated within three calendar years compared to other graduates who took longer than three years to graduate. Characteristics of their degree-majors, demographic characteristics, admission characteristics, and enrollment behavior are explored. Trends in Curricular Exceptions in L&S Academic Programs (PDF) – a report from Academic Information Management, a division of L&S Student Academic Affairs.